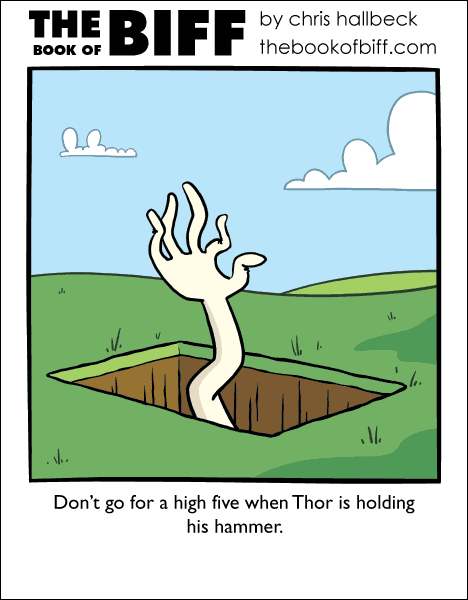 It was weird when I was a kid and an adult would request a high five. I guess if they were sitting down it was okay but a standing adult that was more than twice my height was frightening. It felt like I was a bug that was being squished. I love when this comic gets “weird” and you have to read the caption to understand what is going on! …Well, maybe not the weirdest comic today (compared to e.g. the one where Biff is in the digital world, or the one where all we get to see is a giant shoe), but I like this a whole lot! On the plus side, the clothes are neatly pessed. did anyone else wonder why the hole is square?